It appears from posterior aspects of: (a) first part of the subclavian artery on the left side and (b) second part of the subclavian artery on the right side. The artery arches backwards above the cupola of the pleura and on reaching the neck of the very first rib it ends by dividing into ascending deep cervical artery and ascending superior (maximum) intercostal artery. Deep cervical artery enters backwards between the transverse process of C7 vertebra and neck of the very first rib. It then ascends between the semispinalis capitis and semispinalis cervicis and anastomoses with the deep section of the descending branch of the occipital artery. 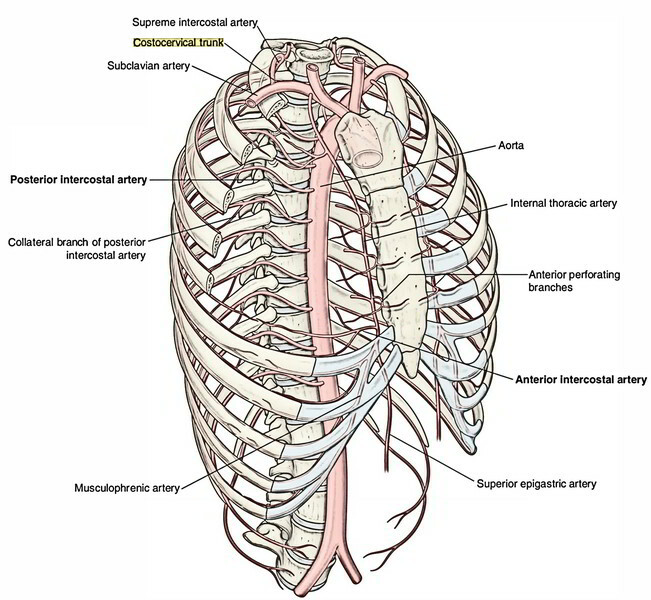 Superior (maximum) intercostal artery descends in front of the neck of the very first 2 ribs and supplies rise to posterior intercostal arteries to the very first 2 intercostal spaces.